Cucumber. Did you know that cucumbers can be used as a face mask?? It turns out in addition to a cucumber salad, there is also a cucumber mask. Yes, cucumber is very beneficial for skin care, especially for women who crave a fresh face, cucumber can be used as an alternative treatment. Cucumber is very useful to refresh the skin, as well as moisturizing cleanser, can minimize pores and skin cooling as the sun. 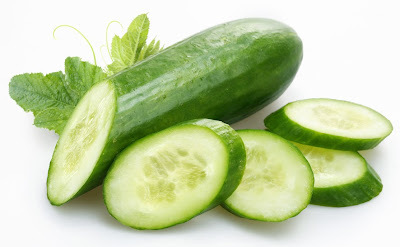 Cucumbers have a high water content, other than that cucumber also contains vitamins A, B and C and some minerals such as magnesium, potassium, manganese, and silica. Cucumber mask is used to tighten the skin. Ascorbic acid and caffeic acid are present in cucumber can reduce the level of water retention, and will reduce swelling around the eyes. So, How Can You Make Cucumber Mask?? 4. Leave on for 15-20 minutes, then wash your face with clean water. It's easy right? Please try the cucumber mask and feel his usefulness.